I am looking for an easy way to gather blocks of text that are scattered throughout an emacs or org-mode document and move (or copy, but move would be preferred) them to a single location. I had thought I could use the kill ring to cut the kill the various items, knowing they would be stored successively in the kill ring, move point to the new location and then yank them back. That would copy, rather than move, but I thought I could start with that. Any thoughts either on accomplishing the specific kill ring objective, or my ultimate goal of moving scattered text will be appreciated. A fourth option is optimized for ease of yanking, at the cost of a little forethought during the killing phase. We use append-next-kill (C-M-w) before the second and each subsequent kill operation. This means that all the killed text is amalgamated into the same entry in the kill ring. So a single C-y is all that is needed to yank it all back at the new location. For instance, a sequence for moving 3 chunks to a common destination could be: C-k C-k to kill 1st chunk, move somewhere, select text, C-M-w C-w to kill 2nd chunk, move somewhere else, C-M-w C-k C-k C-k C-k to kill 3rd chunk, move to destination, C-y and done! Note that only a single C-M-w is necessary before a sequence of several C-k. 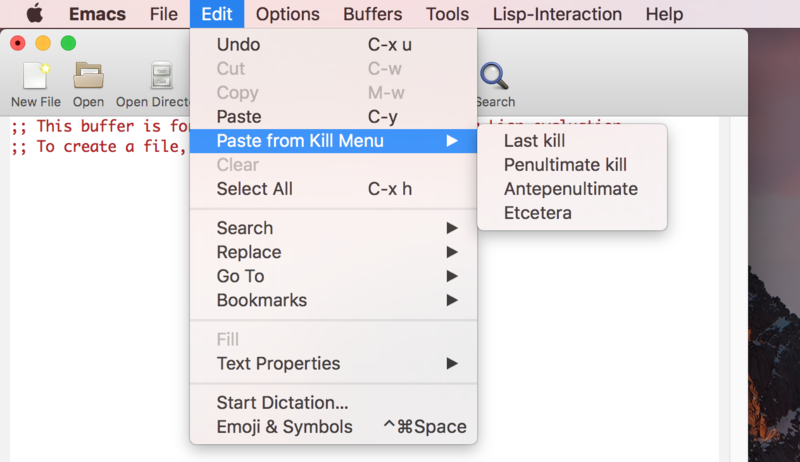 The same is true of other kill commands, such as M-d.
C-M-w runs the command append-next-kill (found in global-map), which is an interactive compiled Lisp function in simple.el. It is bound to C-M-w. Cause following command, if it kills, to add to previous kill. If the next command kills forward from point, the kill is appended to the previous killed text. If the command kills backward, the kill is prepended. Kill commands that act on the region, such as kill-region, are regarded as killing forward if point is after mark, and killing backward if point is before mark. If the next command is not a kill command, append-next-kill has no effect. The argument is used for internal purposes; do not supply one. There are at least two ways of approaching this. To answer your specific about yanking back a sequence of previous kills, you can do this as follows. First, perform all your kills with a series of C-k or C-w (or whatever) in different places. Then, go to where you want to put them and type C-y to yank the last-killed item, followed by repeatedly typing C-2 C-y to access the previously killed items in turn (in reverse order). See Yanking Earlier Kills section of the manual for more details. Personally, I hardly ever use the menus and have disabled most of them, but I do keep the Edit menu around especially for this, since it avoids having to remember where you are in the kill ring. If you want to quickly and directly access any given element of the kill-ring and yank it then there are various options. I'll mention a few. Browse Kill Ring: That pops up a buffer showing the kill-ring entries and lets you pick one. Use command icicle-completing-yank (C-- C-y, by default) with Icicles. That offers completion against the kill-ring, yanking the entry (or entries) you choose. If you also use library browse-kill-ring+.el or library second-sel.el then an alternative selection ring is used if you provide a prefix argument: browse-kill-ring-alternative-ring or secondary-selection-ring. This gives you a way to yank chosen items from two different sets of selections. Use M-y, if you use both Icicles and library second-sel.el. If the previous command was a kill-ring yank command then this does yank-pop -- it yanks the previous kill. If the previous command was a yank-secondary command then this does yank-pop-secondary -- it yanks the previous secondary selection. Otherwise, this does icicle-completing-yank - see #2. You just select text with the mouse/trackpad while holding the meta key down, and on the up-click it automatically yanks itself at the point position. No need for any key stroke. "Drag out a secondary selection, then paste it at the current point. deactivates the secondary selection when it has finished." Note that I modify the function to deal with a couple of minor annoyances with the original: (1) avoid copying invisible text properties; (2) remove the secondary selection overlay as soon as I am done. Not the answer you're looking for? Browse other questions tagged org-mode yank kill-ring or ask your own question. What is the distinction between copying text between a region BEG/END, and copying a region?